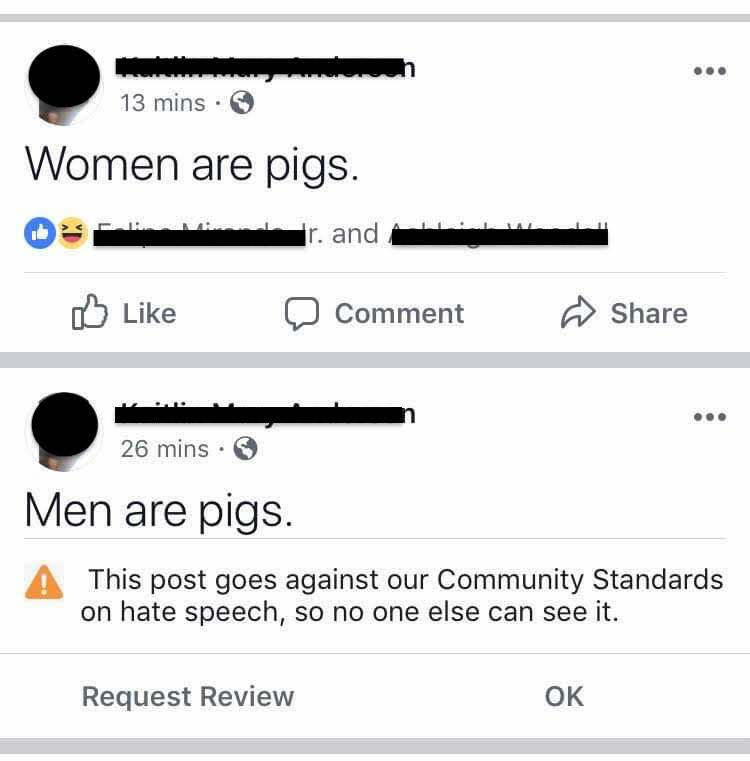 A woman posted a comment on FB sharing her opinion on a topic being discussed. 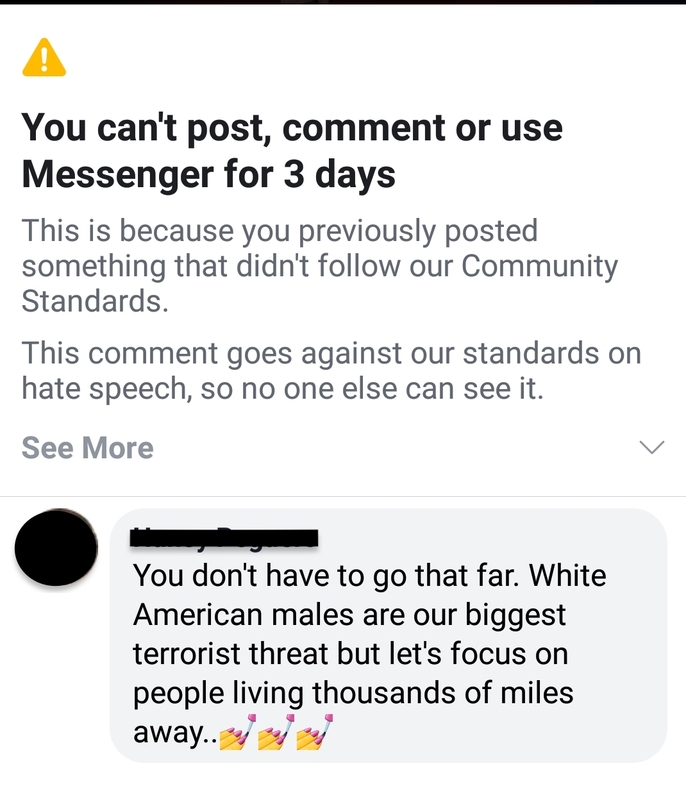 Now most of the time a comment taken out of context is incredibly hard to understand the intent of the person commenting. However, there are plenty of times where a comment is so clearly a valid opinion or statement being said even without the surrounding context in which the comment was directed at. 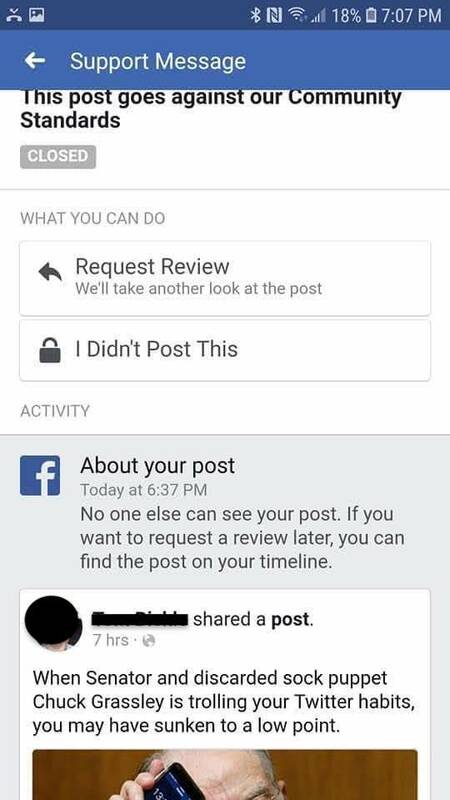 Unfortunately, FB does not care about anything other than what makes them the most profit dollars. 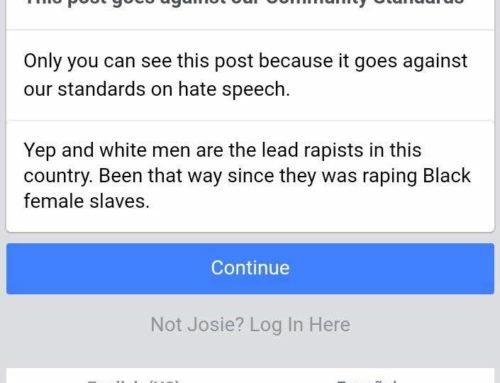 Facebook has decided that hatred and offensive content is the most profitable, which is why Mark Zuckerberg has gone to great lengths to defend allowing content and links shared which deny the Holocaust happened, have created separate definitions for white nationalists vs white supremacists, and allowed InfoWars/Alex Jones to spread violent lies about mass shootings that have happened in America, specifically the families of the Sandy Hook massacre. 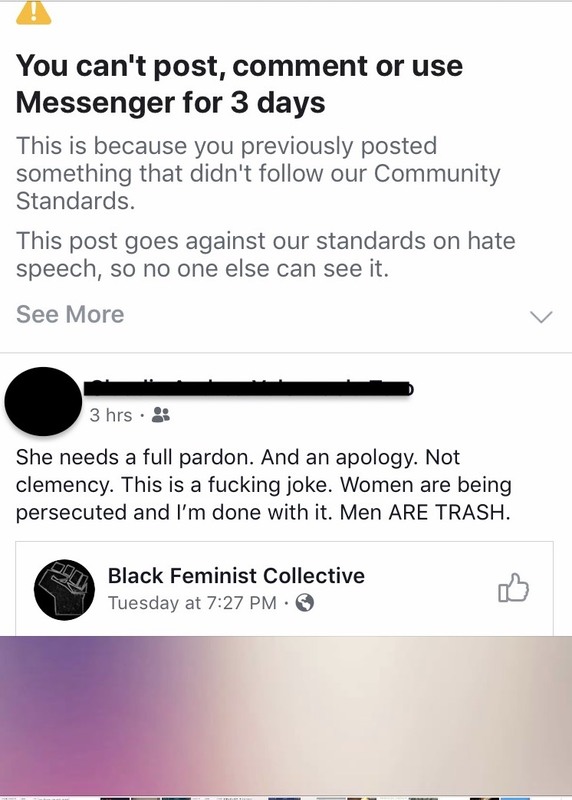 So while all that content is allowed on Facebook, a woman sharing very clearly and respectfully her opinion is deemed “hate speech” by FB and quickly removed by content reviewers. 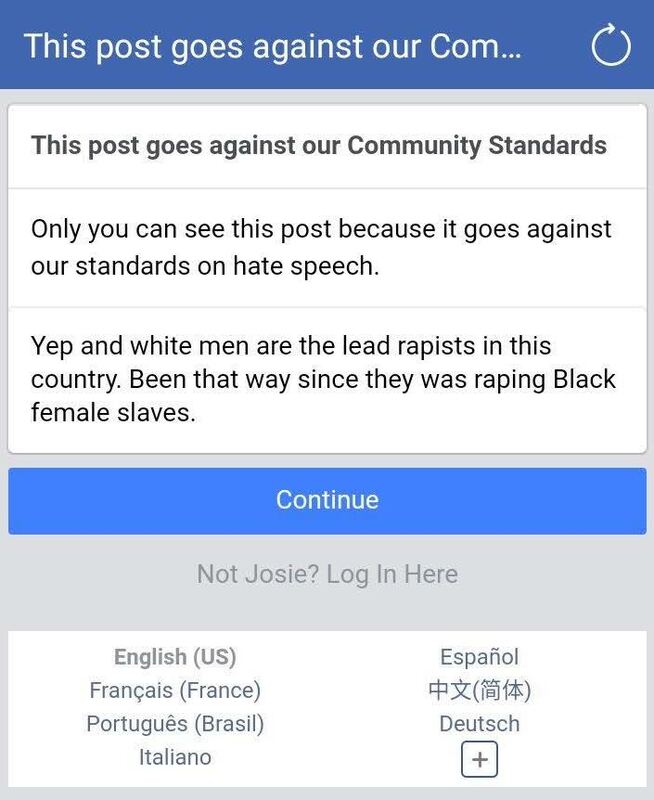 So while Facebook continues to lie to the media and the public that they value all opinions and view points, Facebook very clearly does not value opinions or the 1st Amendment at all. 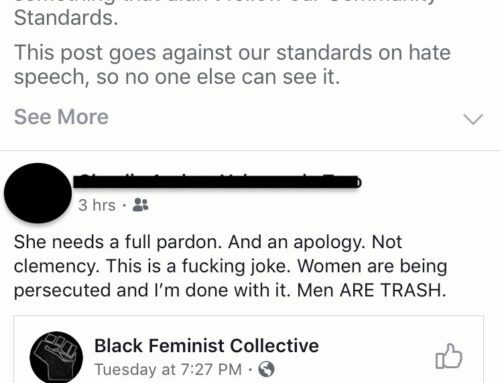 They are actively targeting specific voices on their platform to remove and silence. 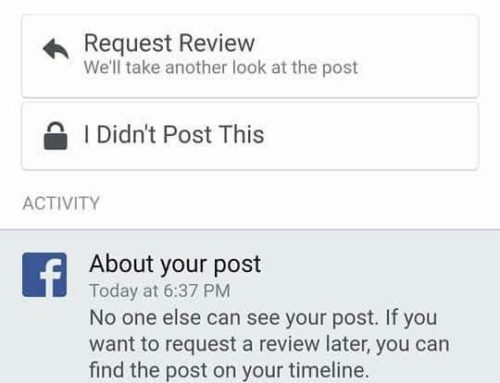 Zuckerberg has also recently claimed that he will created a “independent supreme court” for users to appeal to when content is removed, however, FB has already created this appeal for users that is just a front and provides no actual recourse for users who are disproportionately targeted by content reviewers. 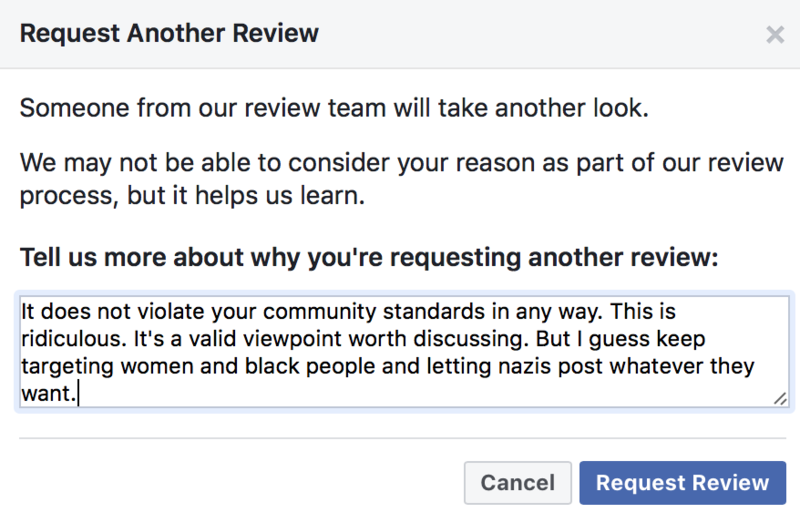 Many users elect this option of having their post reviewed again by FB reviewers only to find out that the request goes ignored never to be responded too or to instantly get “reviewed” again then confirmed it is against community standards. The last 3 times I been banned have been absolutely ridiculous. I know I am targeted for a gender criticsl pro womanradical feminist radical Lesbian viewpoint. 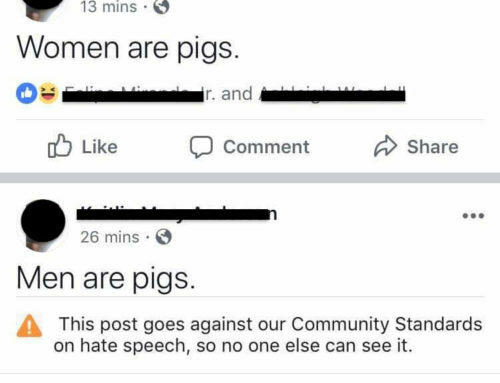 But the reasons are lamer and lamer, my responses milder and milder earning harsher and harsher punishments against us as women and Lesbians particularily. 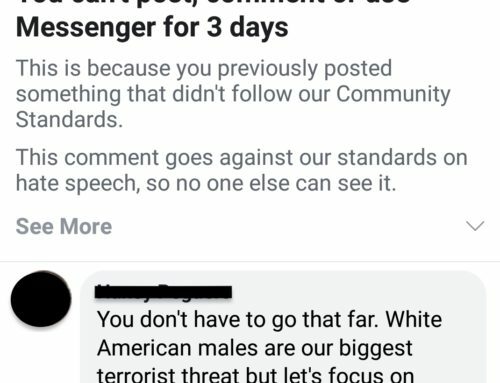 Facebook is Zuckerburg’s hetro white male and autogynophilic playground….